Lucha Comics is an independent publisher whose mission is to showcase unique and awesome stories from all around the world so readers have a chance at getting something different. I commend them on this because taking in new stories is always a risk, since they’re putting all that money into something that may not give them a return. One of their titles, Azteq vs. 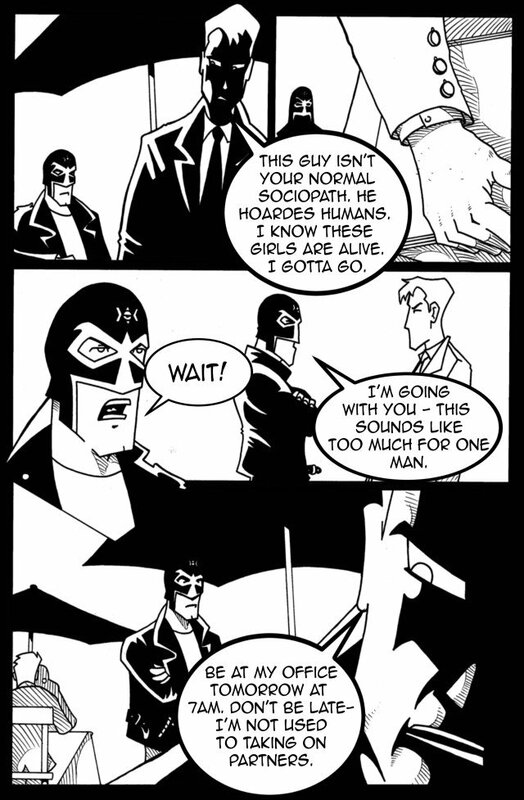 The Prowler, written by Roberto Mercado and illustrated by Kundo Krunch, seemed like such a silly and awesome idea that I lapped it up. 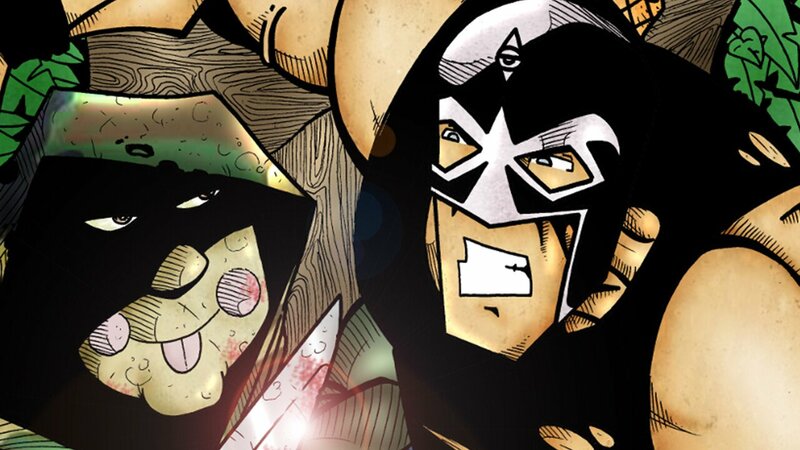 A luchador teams up with a detective to save his ex-girlfriend from a psycho? Hold my phone, I’m diving in! I simply couldn’t say no—but oh boy, did I dive into the shallow end this time. We open to a classic horror movie trope: a couple making out in a car. A cloaked man in a goofy, buck-toothed, clown mask? (I still haven’t figured it out) smashes through the window and slits the boyfriend’s throat. The girlfriend tries to run but gets caught. Meanwhile, a luchador by the name of Azteq wins his latest match, only to be chewed out by his girlfriend, Livie, for being late for their date. He leaves the arena to head to the restaurant but his girlfriend is nowehere to be found, and has left a note saying that they’re through. A couple of days later, Azteq is approached by a detective named Chris Longley. The detective informs Azteq that Livie is missing and is the latest in a series of kidnappings and murders, but he believes Live is alive. Azteq and Longley team up to solve the case and get the girl back. Reading all that, it’s easy to think “how exactly can that be bad?” well, before we get down the heart of the problem with this graphic novel, let’s talk about the art. Illustrator, Kundo Krunch has a…let’s say, “unique” art style. What I do love about Krunch’s work is the use of dark and heavy shadows. Since Azteq vs. The Prowler is entirely black and white, the shady style should be highly effective like Sin City, but unlike Sin City, it’s not nearly as detailed or consistent and appears bland and flat (like a Canadian flash cartoon) because light positioning is way off. 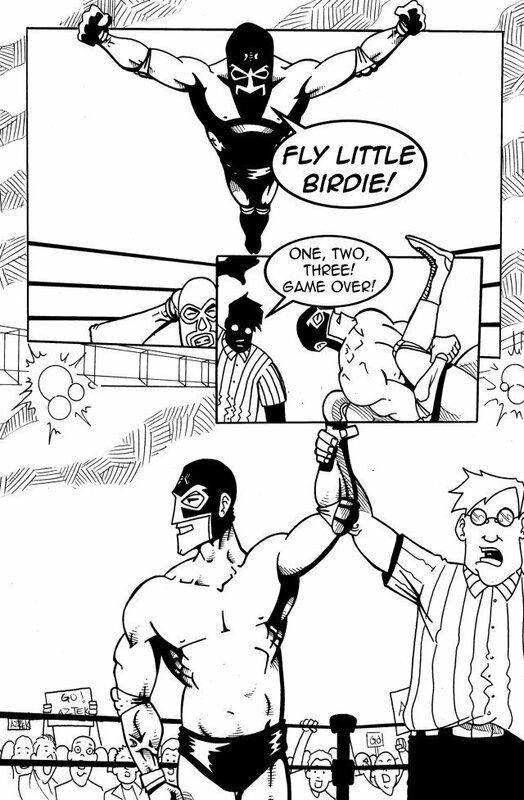 Pages 8-11 during Azteq’s match shows the ref all in black in the background but then show the audience (also in the background) in white despite the light being entirely on Azteq. Even when the crowd is the main focus, there’s absolutely no shading. Most of the storyboards are a jumbled mess; there are boxes overlaying other boxes at awkward angles and speech bubbles cutting into other spaces, making most of the comic a gigantic pain to read. It’s especially bad during the first pages when The Prowler is offing his target’s boyfriend. Some panels block the action scenes and I couldn’t see what was going on until I had read it a couple times. Those problems could have been disregarded if the character designs weren’t so…cheap. I get that Krunch is going for an odd tone and style but looking at his characters makes me think of a dollar store version of Cybersix. The key difference being that Cybersix had a weird art style that was heavily detailed, awesome to look at and used heavy shadow properly. It wouldn’t surprise me if that comic inspired Krunch since it’s Argentinian and he’s from Argentina. At least the facial expressions on Krunch’s characters are hilarious and exaggerated, almost reminiscent of fifties horror comics like Tales from the Crypt. Here’s the thing; I can completely forgive any medium’s artwork as long as the story is great. Roberto Mercado’s story is perfectly fine. So…what’s the problem? Well, you know that synopsis I wrote? Yeah, that’s literally the whole thing minus the ending. That right there is the main problem with Azteq vs. The Prowler and I really wish I was exaggerating. If there’s absolutely one thing I can’t stand in any medium, it’s when a great idea doesn’t get executed to its full potential. Azteq vs. The Prowler is about 66 pages long, which is not nearly enough to flesh everything out properly. The pacing is like watching a movie on fast-forward; something would happen and then the book would move on to the next thing too quickly. I didn’t care about any of the characters—who were one dimensional and uninteresting—because I never got a chance to know them. Azteq seems like a nice, cool guy. He’s a hero in the ring and in the streets—but why? What’s his motivation? 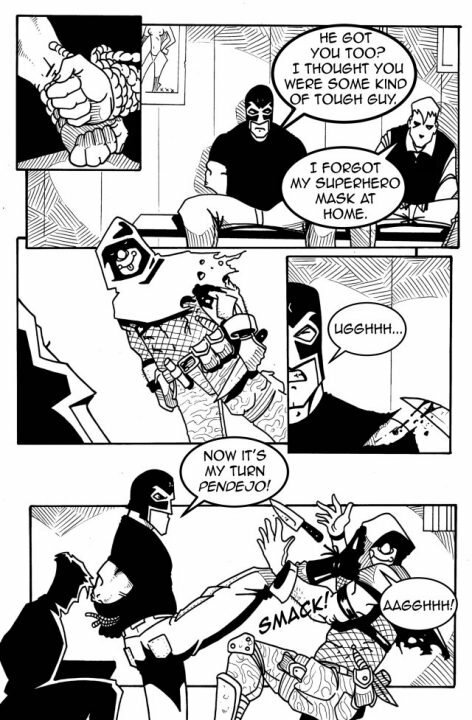 How did he become a luchador? I never got to find any of that out. Why was The Prowler the way he was? Who was he exactly? Why was he kidnapping women? I never felt any sense of fear when he appeared since I knew there was no sense of danger, nor did I care. The sad thing here was that Mercado had a silly but decent idea that easily could have been a Criminal Minds episode if only he made it bigger. Stretching out the graphic novel into three volumes would have been more than enough. We could have seen The Prowler take out more victims in brutally disgusting ways. We could have seen more on how he operates and his motivation for taking women. We could have had some buddy time with Azteq and Longley; they could have gone through a list of suspects and had that last minute realization of, “this dude’s the killer!” It would have been a bit cliché but it would’ve at least had a story arc. Azteq vs. The Prowler is like a procrastinator handing in an assignment; cheap, lazy and rushed.